Three tracks today from an album which, before yesterday, I wasn't even aware of. But what a find! This comes courtesy of a regular WWR contributor who usually prefers to remain anonymous: you've also got him to thank for 'discovering' Meade Skelton and Amy Beth Parravano. Well, yesterday a package arrived at my office from America containing three albums, one of which was the utterly fantastic Sounds of Freedom - Brigham Young University Singers. The whitest of white-bread versions of the already pretty white Up With People (the touring choir founded by J. Blanton Belk in 1965 as 'a positive voice for young people'), The Sounds of Freedom were formed in 1966 when 50 of the 23,000 students at the University were chosen from the main choirs on campus to perform a selection of songs around the theme of freedom. The Sounds of Freedom toured the States, appeared on TV (including the Ed Sullivan Show) and, naturally, were persuaded to record an album - all the time touting their message of peace and sounding to all the world like the soundtrack to a future episode of South Park. It's a wonderful record, a mish-mash of peace-protest standards, Christian hymnals and songs from film soundtracks, including Born Free and How the West was Won. The young men and women of the choir sound at once impossibly out of time and out of place: comparisons to other choirs of the day such as the Mike Curb Congregation or Mitch Miller and the Gang don't really do it justice. It's brilliantly 'straight'. 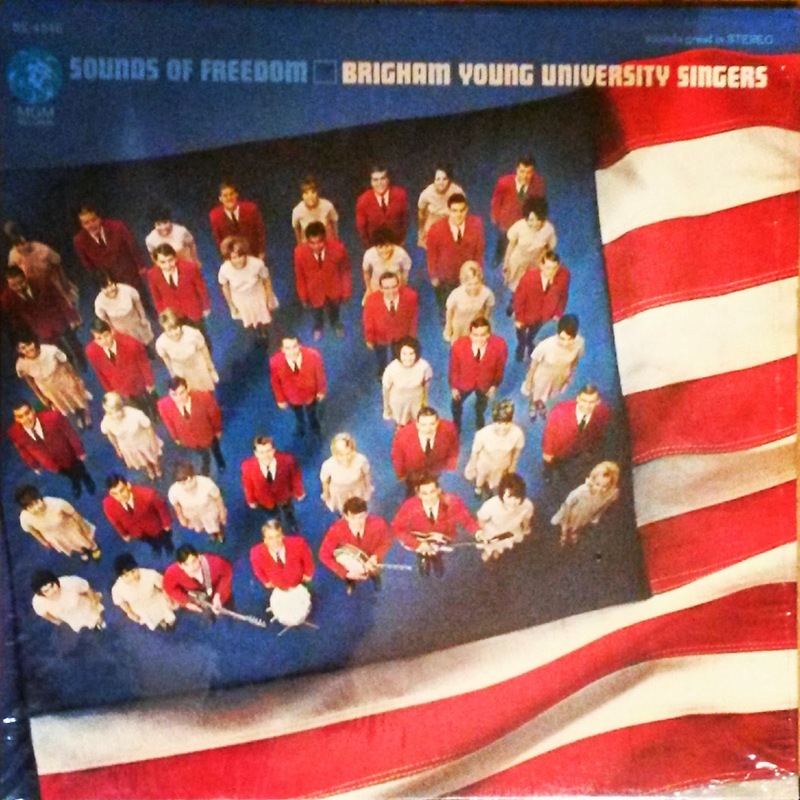 One of the many offshoots of the Brigham Young University Singers, a choir which still exists today and has, during its long career, recorded around two dozen albums, the BYU Sounds of Freedom continued to perform for at least a decade. Performing both patriotic and contemporary numbers, the BYU Sounds of Freedom projected love of their country and of life to hundreds of thousands of people around the world: summer 1974 found them performing in South Africa for some 54,000 people. Brigham Young, for those of you who didn't know, was one of the early leaders of the Church of Jesus Christ of Latter Day Saints (LDS) or the Mormons. Oh, and he was famous for having 55 wives and 56 children. The greedy bugger. So here are three tracks from the 1967 MGM album Sounds of Freedom - Brigham Young University Singers: the opening track, the ridiculously funky A New Tomorrow and, from Side Two, Mr Washington and Freedom Isn't Free. And a big thank you from me to our anonymous benefactor. No single artist has inspired as many tribute singles – literally hundreds, possibly thousands - both during his career and after his untimely demise as the late Elvis Presley. Certainly Elvis must be the second man after Jesus Christ (I’m not counting God here as he’s not, nor never has been, a human being) to have so many tonnes of vinyl wasted on rotten recordings of rotten songs by rotten singers and rotten songwriters: there’s been enough plastic dedicated to Elvis tributes to double the size of the Great Pacific Garbage Patch. So it’s about time we dedicated a few posts to this phenomenon, don’t you agree? John Daniel ‘J D’ Sumner (or His Friend J D Sumner as he credits himself on both sleeve and label of the tawdry little record) was an American gospel singer, songwriter, and music promoter. Born in 1924, he was a member of a number of vocal groups including the Sunny South Quartet, the Dixie Lily Harmoneers, the Sunshine Boys and the Stamps Quartet, who later became known as J D Sumner and The Stamps. 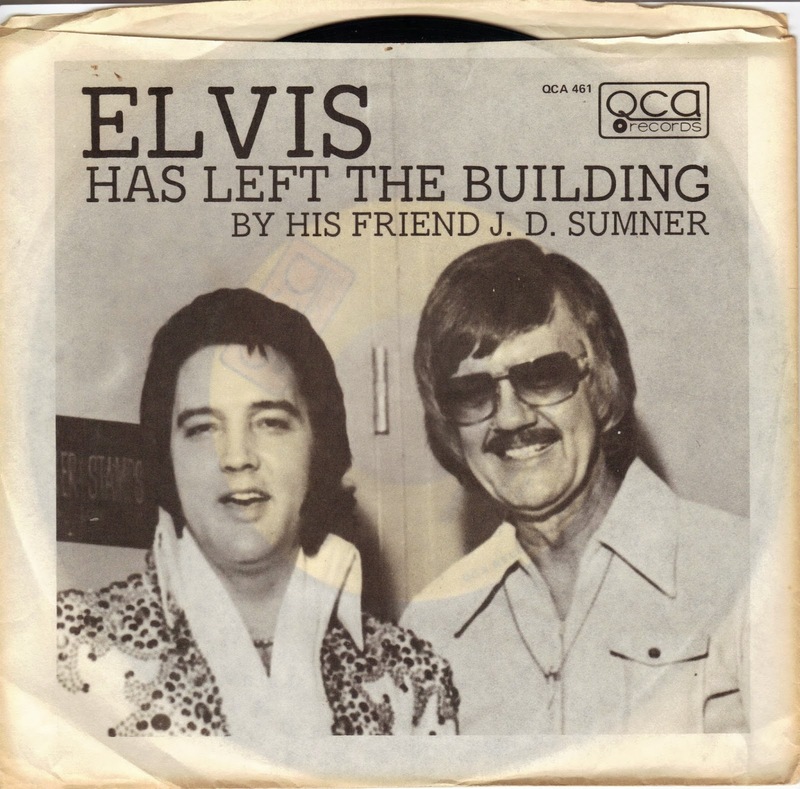 The story goes that Elvis idolised Sumner's singing after seeing him perform with the Sunshine Boys, and Sumner sang at the funeral of Elvis’ mum Gladys. 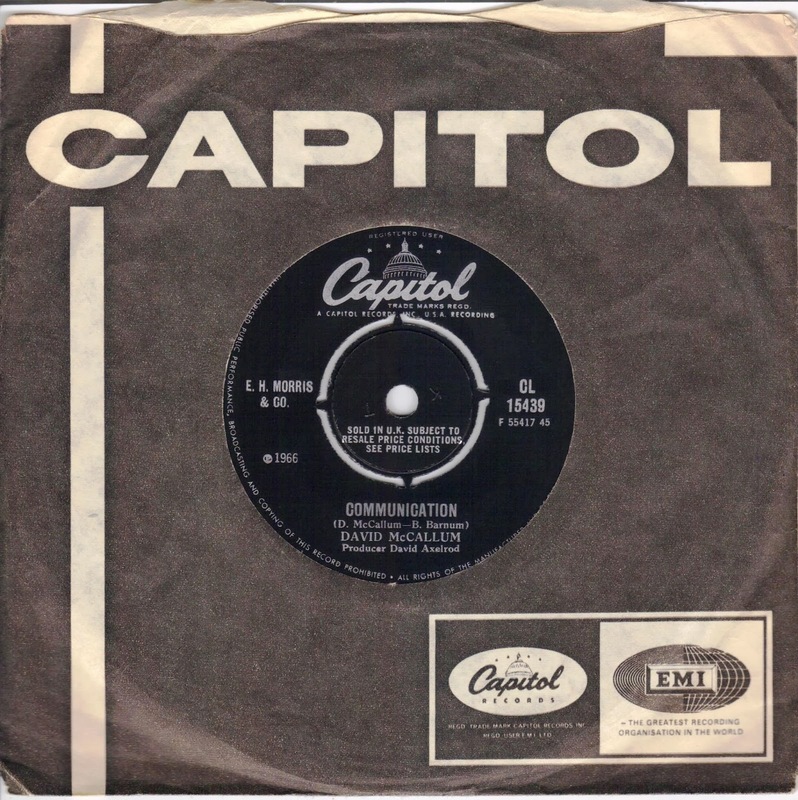 Presley hired Sumner and The Stamps as his back-up singers in late 1971, and the group toured and recorded with him until Presley's death in 1977 (interestingly, on back sleeve to the 45 states that The Stamps only toured with Elvis for four years). Having already done the same favour for Mama Presley, Sumner also sang at Elvis’ funeral. Which in no way explains how he released a record as shockingly awful as Elvis Has Left the Building, his tribute to his friend and former employer. Sumner, who also provided the bass voice on Way Down, one of Elvis’ last hits, narrates the story of the King’s life and death in the most boring fashion imaginable. Written by Sumner himself (the B-Side Sweet, Sweet Spirit, was written by Doris Ackers) it’s absolutely horrible: a full five minutes of funereal music and sonorous vocals. Sumner reads his lines like a gravel-voiced hypnotherapist going through the motions for a particularly boring patient. Absolute rubbish. And this from a man who, for 18 years, For eighteen years, held the Guinness World Record for recording the lowest bass note. You’d expect something a little more engaging: mind you, in the same year as this was released Sumner and the Stamps also issued the bad-taste album Elvis' Favorite Gospel Songs (Sung at His Funeral). Sumner, who co-founded the Gospel Music Association in 1964 and is credited with being the first artist to customise a coach for groups to travel and sleep in, continued to work right up until his death in 1998. It’s not recorded if he ever performed Elvis Has left the Building live. Today Rick Wilde is a successful songwriter, producer and musician: the son of British rock ‘n’ roll star Marty Wilde and the brother of national institution Kim. 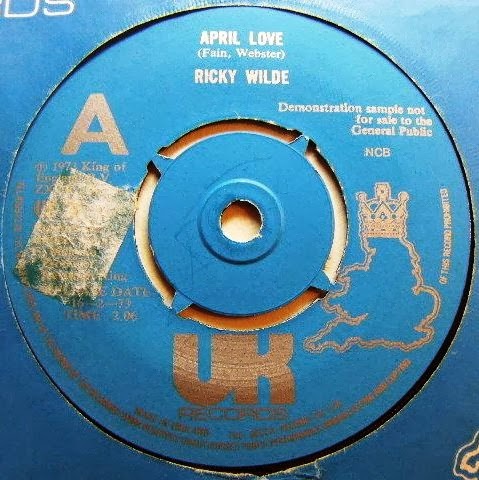 But 40 years ago, as Ricky Wilde he had a nascent pop career all of his own. Richard James Reginald Steven Smith (to use his given name) was marketed as Britain’s answer to Donny Osmond, yet Ricky’s half-dozen singles for Jonathan King’s UK Records failed to make much impact. Shame, because his first, I Am An Astronaut (which was later covered by Snow Patrol), is a belter; recorded when Ricky was just 11 years old it’s a fun little pop record that deserved to be a hit. Unfortunately the rest of his releases were not in the same league - as you'll soon hear. A couple of sides did minor business in Europe, but although he was groomed for stardom, featured in teen magazines and on television (in the Man Alive documentary film Twinkle Twinkle Little Star) Ricky failed to take off with the teenyboppers. Mind you, when you’re given material as paper-thin as this it’s no surprise: round and round like a spherical ball indeed! Here are both sides of Ricky’s single April Love/Round and Round plus the A-side of his first release I Am An Astronaut. April Love was, of course, previously recorded by WWR favourite Pat Boone. I spent far too much time - and far to much money - over the Christmas and New Year period looking for more crap to confound you with. Whilst perusing eBay I was lucky enough to find, and purchase, a copy of a 45 I have been after for years - the very one I present for you today. Born is Aston, Birmingham in 1947, Paul Henry went to school with Jeff Lynne, who would of course go on to form the Electric Light Orchestra with Roy Wood. He trained at the Birmingham School of Speech and Drama and went on to spend eight years at the Birmingham Rep before, in 1975, joining the cast of TV soap Crossroads, playing the role of the simple-minded handyman Benny Hawkins until 1988. It’s true to say that Benny wasn’t the sharpest knife in the drawer: under his soft wooly hat lurked a soft, wooly brain. As the Birmingham Mail once put it our Benny was ‘slightly smarter than a plank, though not quite as bright as plankton’. But the character soon became one of the most popular in Crossroads, and Henry’s turn as Hawkins provided plenty of material for TV impressionists. No wonder then that, in 1977, he was dragged into the studio by Simon May to produce this monstrosity. May had long been associated with Crossroads, penning hits for several of the show’s stars and storylines, including Born With a Smile on My Face for Stephanie de Sykes (used within a storyline on the show), More Than in Love for Paul McCartney’s cousin Kate Robbins and The Summer of My Life, a Number Seven hit for May in late 1976 and which originally appeared in Crossroads. He would later have chart success from his involvement with BBC shows Howard’s Way and EastEnders. Benny’s Theme is a seriously peculiar record: ominous and orchestral, with Paul reciting the lyrics as if they were a Shakespearian soliloquy. The lyrics reflect Benny’s lack of luck in the love stakes, and the music at times hits a John Miles/Jeff Wayne vibe: the song was recorded in the same year as Wayne’s version of War of the Worlds but issued before that particular bombastic nightmare. 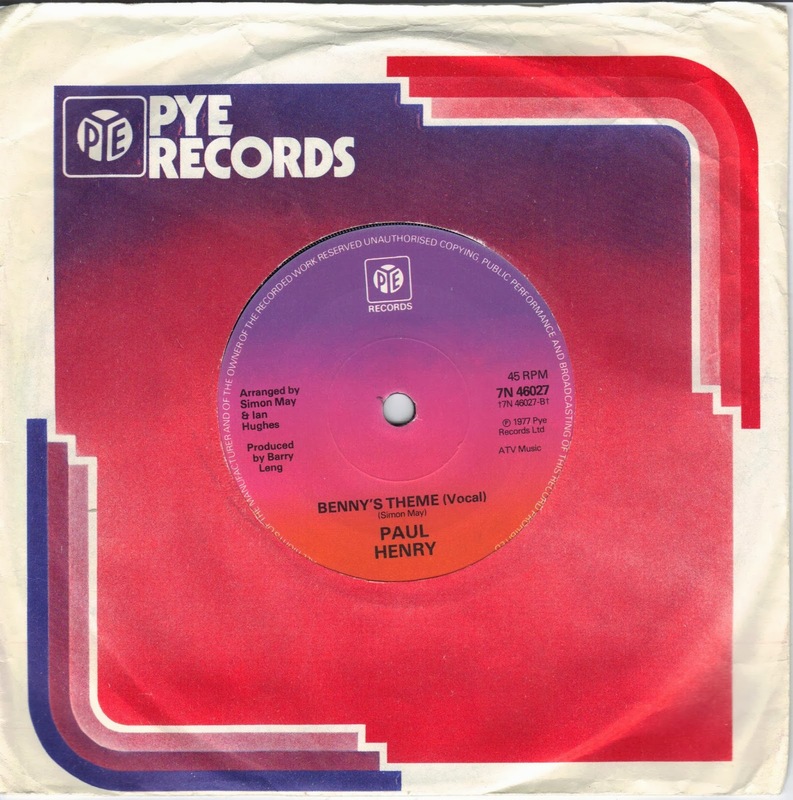 The B-side, an instrumental version, is credited to Paul Henry and the Mayson Glen Orchestra; I believe that Mayson Glen is a pseudonym for Simon May himself. The disc peaked at number 39 in the UK Hit Parade in January 1978. Crossroads co-star Kathy Staff recorded her own tribute to the wooly-hatted handyman, Benny, but that failed to chart. A second single, Waiting at the Crossroads, (issued in a black and white picture sleeve featuring Henry as the hapless Hawkins), also bombed. Benny was a hard act to follow. “I ended up playing the sort of popular character who got trapped in the public imagination,’’ he told a reporter from the Birmingham Mail. “That’s certainly what the Benny character was. “People ended up expecting me always to be Benny. I had to try to break away from that if I wanted a career beyond Crossroads.” Although he struggled for many years to leave behind the bumbling bumpkin he’s still acting: in 2010 he toured the UK in a play based on comedian Tony Hancock’s famous Face to Face interview. Back in the 60s, when TV was king, just about every primetime TV star was hauled into the recording studio to make a record. Some cut a few campy sides (pretty much the entire casts of Batman, Bonanza and Star Trek are guilty here); others made a half decent stab at pop balladry and quickly scuttled back to their respective soundstages. Others still, as we have seen with Peter Wyngarde, were offered the freedom to do pretty much whatever they wanted – with shocking results. And it’s here that we find today’s bad record. David McCallum, now aged 80, was one of the brightest stars of 60s TV. As Illya Kuryakin, a Russian-born secret agent, he co-starred in the hit series The Man from U.N.C.L.E. before going on to appear in Colditz, Kidnapped, late 70s science-fiction series Sapphire & Steel, The Invisible Man and, more recently NCIS. He’s also a classically-trained musician with an impeccable heritage: his father, David Senior, was leader of the Royal Philharmonic Orchestra, the London Philharmonic Orchestra, the Scottish National Orchestra, gave Jimmy Page the idea of playing guitar with a cello bow and played on the Beatles’ crowning achievement A Day In The Life. For a full decade he led Mantovani’s orchestra. Phew! When David Junior was offered the chance to record an album he, very wisely, chose not to sing but to arrange and conduct light orchestral versions of au courant hits. Capitol teamed him up with producer and arranger David Axelrod, who employed his crack team of session musicians to record four albums of jazz-tinged covers, all of which are pretty decent; a cut above anything else put out by a TV star that you’re likely to hear. The first two volumes Music…a Part of Me and Music…a Bit More of Me sold reasonably well and one particular track, The Edge has become one of the most sampled pieces in Hip-Hop, used by artists including Dr. Dre, Missin' Linx and Masta Ace. But what Capitol didn’t have was a hit single. So, despite his best intentions, McCallum recorded four vocal cuts for potential release. Working with songwriter H B Barnum (who had written a song called The Man from U.N.C.L.E. for Capitol act the Gallants and who would go on to write Northern Soul classic What – recorded by Judy Street and, later, Soft Cell) he came up with his first 45 – which, dear readers, I present for you here today. Communication/My Carousel must have frightened the life out of people when it arrived. Certainly, if they were expecting more of the same light jazz that his albums had offered they were in for a big surprise. On the B-side especially McCallum sounds like a man possessed. I do love the harmonica and the bass (if you think you recognise that bass sound you’re right: that’s ace bassist Carol Kaye, famous for her sessions with Phil Spector and Brian Wilson), but the vocal performance is demented. The A-side (compiled on the must-have CD Music for Mentalists) is just rubbish: the arrangement is awesome, especially the last few seconds which sound exactly like Brigitte Bardot’s brilliant Harley Davidson, but the lyrics and vocals are ridiculous. What a great record! Despite his worldwide fame, the single failed to resonate with the kids, missing the Top 30 in the UK and - as far as I am aware - failing to chart elsewhere. He followed this up with one further 45, In The Garden – Under the Tree/The House On Breckenridge Lane which, unsurprisingly, failed to chart.